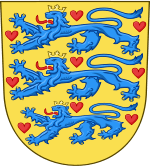 The House of Estridsen, sometimes called the Estridsen or Estrith Dynasty, was the dynasty that provided the Kings of Denmark from 1047 to 1412. The dynasty is named after its ancestor Estrid Svendsdatter. The dynasty is sometimes called the Ulfinger, after Estrid's husband, Ulf the Earl. Their family coat of arms became the coat of arms of Denmark. The name of the Estridsen dynasty recalls their acquisition of the Danish crown through the marriage of Ulf the Earl to Estrid Svendsdatter of the House of Knýtlinga, daughter of Sweyn Forkbeard and sister of Cnut the Great. Later genealogies trace the family from Jomsviking leader Styrbjörn the Strong, a scion of the Swedish royal family, who are in turn given a descent from legendary King Sigurd Hring, regarded as mythical by most modern historians. The reliable ancestry traces no earlier than Ulf's own father, the obscure Thorgil Sprakling. The dynasty reached its peak with the Kalmar Union, when its members reigned as kings of Denmark, Norway and Sweden in personal union. The dynasty came to end in 1412 with the death of its last member Queen Margaret I. All of the subsequent monarchs of Denmarks were cognatic descendants of the House of Estridsen.